Ponta Delgada, the capital of the island and seat of many departments of the Regional Government is today the most important and with around 35,000 inhabitants also the largest city in the Azores. It boasts the archipelago’s only university, which was founded in 1975 and counts about 1,000 students today. The former fishing village became capital in 1546 after Vila Franca do Campo, the up to that date principal town of the island, was almost completely destroyed by the terrible earthquake of 1522. With the Fort São Brás being built in 1544, the port became safer and it developed soon into the main port of the archipelago, the main merchandises being cereals, corn and pastel in the early days and later oranges, with the orange exportations reaching their climax in the 18th century. In 1861, the foundation stone was laid for a new harbour, claimed by the orange barons to create better conditions for the exportation of their delicate goods, but even when the orange trade broke down due to an insidious mycosis, the construction works on the extension of the harbour continued, creating an important base for several industries settling around it. 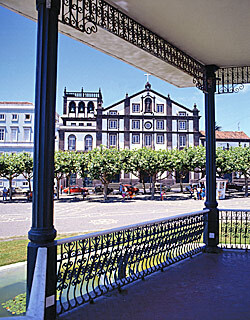 The impact of a thriving international trade, particularly with Flanders and England, during the 18th and 19th century, is witnessed by Ponta Delgada’s rich architectural heritage, comprising many remarkable palaces, churches and manor houses, where the Baroque style is prevailing, mixed with curious examples of urban architecture from the 17th, 18th and 19th centuries, testimonies of the island’s connection with the rest of the world. Another extension to the harbour happened in 1940. 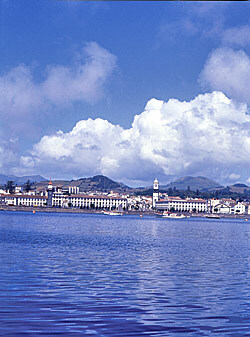 It also included the construction of a 1,544 m long pier, whose western end is marked by the Fort of São Brás. The flat, rectangular city of Ponta Delgada stretches for about 3 km along a beautiful bay, with some houses sprawling on the gently sloping green hills in the backdrop, offering an extremely picturesque sight for everybody arriving from the sea. In spite of the various architectural styles, including the modern buildings of the 20th century, displayed in this pretty town, the visitor is struck by a great harmony, adding to Ponta Delgarda’s unique charm. Starting from the endless seaside promenade Avenida Infante Dom Henrique, the city’s layout is characterized by several long streets running parallel inland, intersected by many small and narrow alleys, featuring black and white tiled pavements, and enlivened by attractive squares and relaxing green spots. In the meantime, some pleasant pedestrian zones, with attractive shops and inviting cafés and restaurants, have also been created. There is no way to get lost on your sightseeing stroll and anyway, you always have the ocean for orientation. The pleasant Avenida starts in the west at the stout walls of the Fort and ends  just past the large modern public swimming-pools - at the marina, which was only built in the 1990’s, in the east; further west is only the airport and further east, you will reach the city’s beaches. Ponte Delgada’s tourism office is also located on this promenade. Despite its importance for the whole archipelago, Ponta Delgada has kept a human size, which makes it easy to explore the city by foot. (The only problem being caused by today’s traffic in the narrow streets of its centre, it is not advisable anyway to drive round with a car.) Since 2001 exists also a tourist train, which starts in the main street south of the Praça 5 de Outubro and takes tourists for a comfortable sightseeing tour through the city’s historic centre.